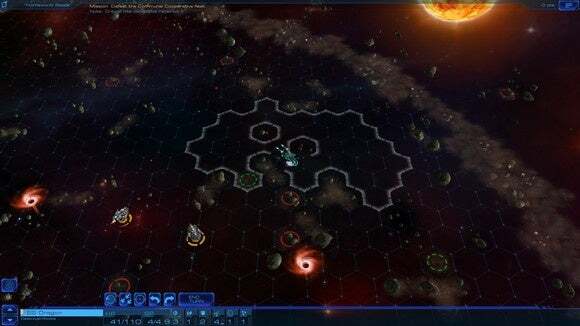 Sid Meier's Starships comes out on March 12, which isn't that far away. As such, I don't really want to delve too deeply into the game because, well, I'm going to have to write the whole thing up again in two weeks when we review it. 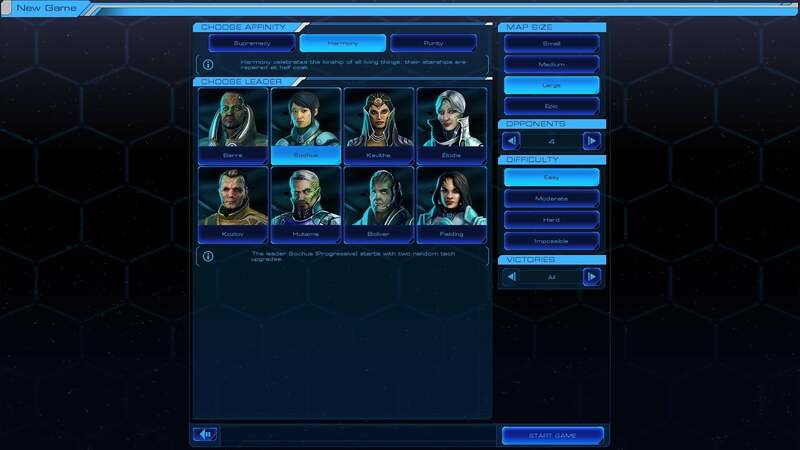 But I did spend about an hour tooling around with a pre-release build earlier this week, and it only seems right to give you an idea how this spin-off strategy game (of sorts) is shaping up. You know that absurdly-complicated board game Ben Wyatt comes up with in Parks & Rec? "The Cones of Dunshire"? If you don't watch the show, here's a clip. If you don't feel like watching the clip, know this: It's identifiably a board game, except there are so many rules it's rendered practically unplayable in a normal tabletop setting. In many ways, Sid Meier's Starships is its own Cones of Dunshire. And I don't mean that because Starships is hard to figure out. It's not, actually! As a video game it's surprisingly easy to grasp, especially if you're coming over from Civilization's time-consuming, multi-tiered strategy. Starships is identifiably a board game though—just one you'd never want to play manually a.k.a. on an actual board. There are too many moving pieces, too many factors to each encounter (line of sight, 100+ point damage calculations, et cetera) to really make it feasible. But it still feels like something designed for a tabletop environment and moved over to digital space. Like Civilization, you'll start the game by choosing a faction leader. These have various buffs from "Gets an extra starship" to "Starts with two random tech upgrades." Of course, the first time you play you'll probably have no idea what any of this means or what's most useful. 1) Travel to neighboring star-systems to complete missions and gain influence. 2) Complete missions to gain influence (two blue ring sections) and receive resources from that system. 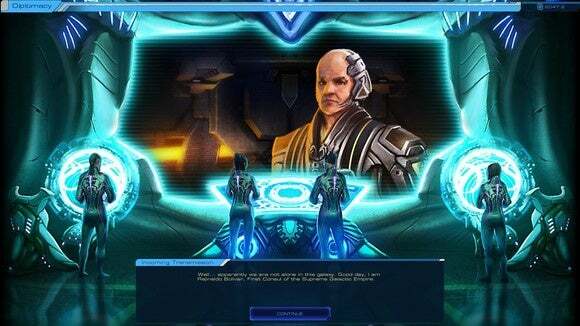 3) Earn four influence ring sections and make the system part of your Federation. 4) Expand your Federation. Control 51 percent of the galaxy to win the game. 5) Be sure to use the advice and SpaceOPedia buttons at the bottom of the screen for more information. Easy, right? I mean, that last one isn't even a rule. You start with one owned planet—your Homeworld—and one other visible planet. This strategic layer is the primary board of play, and more planets will be revealed as you begin exploring. 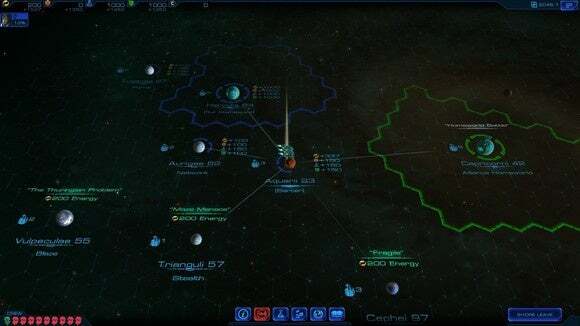 Moving to an undiscovered planet will bring up a mission, such as "Marauders are attacking!" Any amount of preparatory work is allowed. You can upgrade your ships, for instance, or examine the likelihood of victory. Eventually you'll either decline the mission and flee or accept the mission and transfer to a secondary map—like a board game glued onto another board game. This map is all about tactical play, directly controlling your fleet of ships on a hexed plane and trying to outmaneuver the enemy. Missions have various goals, though most involve straight combat. Winning then liberates the planet and brings 50 percent of its populace under your domain. 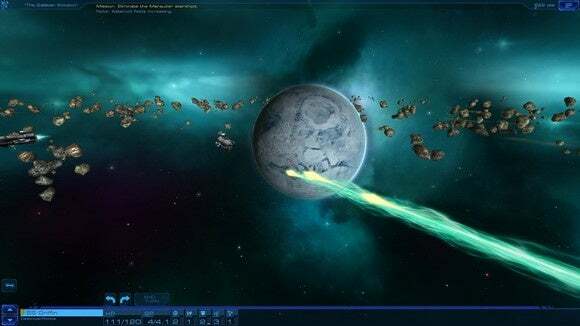 You need to control 100 percent of the populace to control a planet, and (as mentioned) you need to control 51 percent of the planets in the galaxy to win the game. You can complete missions on multiple planets each turn, but your crew will become steadily worn out and eventually need to rest. How the late game works, I'm not sure. Our preview code is currently turn-limited, so I basically get to complete a handful of missions before the game stops. There are all sorts of things you can do on each planet—build cities, build improvements—but I've barely touched any of that. I'm also not sure yet what happens if you take over an enemy's Homeworld. Does their entire dominion fall under your control at that point? Another question to answer in our review. And if there's one thing I think could use an upgrade, it's the UI. 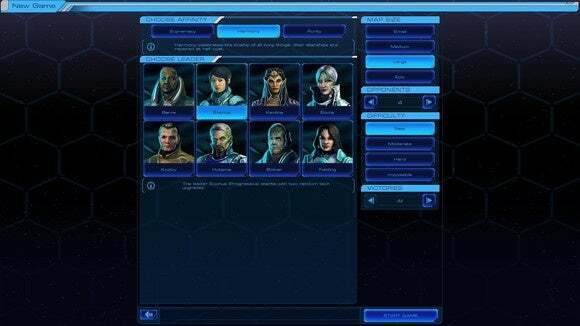 Like Civilization: Beyond Earth, the user interface seems oversized and kind of artless, which is still baffling to me when compared to how gorgeous Civ V looks. I'm enjoying Starships, though. Unlike Civilization, which seems to take fifty or a hundred turns to get going and then can take upwards of 300 turns to end, Starships seems like a (relatively) quick strategy burst—maybe an hour or two per match. I'll verify that when I get the full release, but that's the impression I get so far. That could be great for those who want some of the basic feel of Civilization without the implied "thirty hours of your life" time debt. We'll have a more in-depth look at the game in a few weeks when the game releases. For now, I think I'm going to play through the preview code one more time. Current verdict: Strangely addictive, even unfinished.